Fire apparatus, commercial truck, school bus, and many other manufacturers trust CAPE to ensure their vehicles’ cab integrity meets industry safety standards. A cab undergoing this kind of testing must pass three performance criteria. After each test, the cab of the vehicle must exhibit survival space accommodating a 50th percentile male ATD in the median position without contact between the ATD and non-resilient parts for all seating locations. None of the doors shall open during the tests. 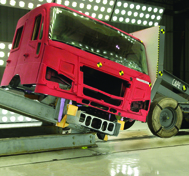 The cab attachments may be distorted or fractured, however, the cab shall remain attached to the vehicle frame. We perform three tests to SAE specifications J2420 and SAE J2422.